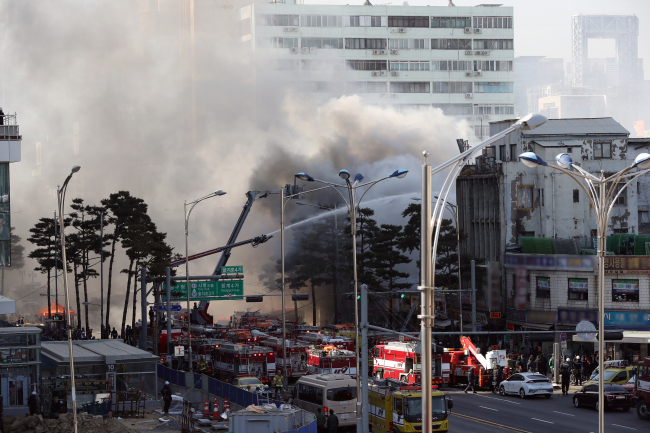 A fire broke out at a hardware store in a building near the Euljiro 4-ga Subway Station in downtown Seoul at 12:35 p.m. The fire caused a large cloud of smoke to cover the Jung-gu and nearby Jongno areas. Fire officials are currently trying to put out the fire. There have been no reports of casualties so far. After the blaze began, the government sent out an emergency text to nearby residents at around 1:40 p.m., alerting them of the fire and asking them to exercise caution.